The temperature has risen and the sun is shining which means that summer BBQ and backyard party season is upon us once again. Flag Day, the 4th of July, and Labor Day are just around the corner. Not feeling stressed about what you're going to bring to the party this year means you need to meal plan now. Cold pasta salads are one of the best portable foods and they are easy to make in large batches big enough to feed a crowd. Below I have gathered twenty-seven summer pasta salad recipes that are perfect for any type of family get together, any time of the year. They can be whipped together quickly, which will give you less time to stress and more time to spend with the family you love. I have a difficult time trying to choose my favorite summer pasta salad recipe from this list, as I have loved each and every one that I have tried. It really depends on what I am in the mood for that particular day. Looking for other sides for your barbecue? Check out our old fashioned potato salad recipe and this no-mayo coleslaw recipe. Wow! There’s a lot of idea to bring to BBQ’s this summer. They all sound amazing! We just had a crab pasta salad for dinner tonight. It makes a great summer dinner idea! Pasta salad is such an awesome side dish during the summer. I love to make a big one up for potlucks. Love cold pastas.. I make one with italian dressing it is amazing!!! I like cold pasta salad in the summer, certainly some interesting ways to change it up here once in a while. Zesty Italian Pasta Salad and Greek Pasta Salad look good to me. I love pasta salad in the summer, thanks for sharing. Pasta Salad is my favorite! I have a traditional recipe that I make myself all of the time, so I am definitely happy to try some new ones! 🙂 Thank you so much for sharing! The Spinach Artichoke Dip Pasta Salad sounds the best to me. 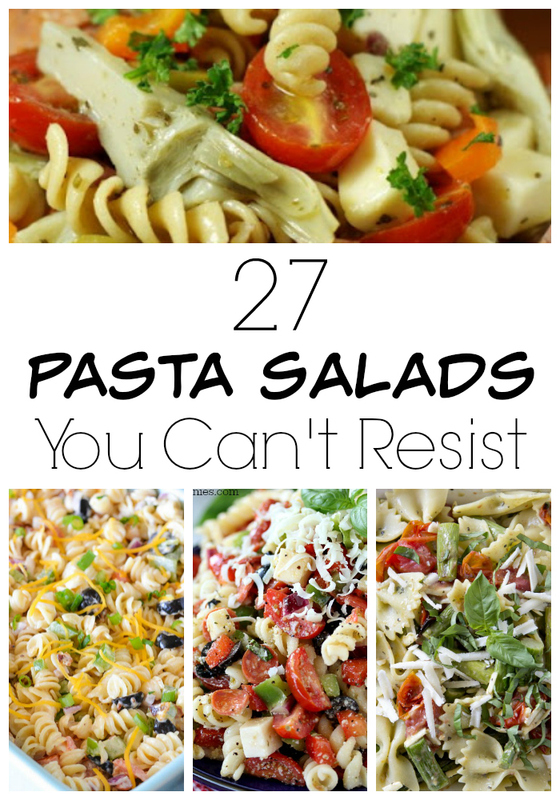 Pasta salads are my favorite to bring on picnics.